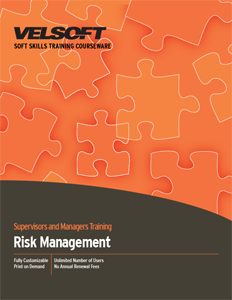 Risk Management Training Material is designed to train employees and supervisors skills and techniques for risk management. Trainers can confidently develop skills to respond to risks, learn how to respond to risks, reaction planning, and more! Seeing is Believing This sample manual to teach Risk Management is in MS Word format. For trainers who want to demystify the complexities of risk assessment and management, or give a dynamic risk management presentation that clearly explains the benefits and procedures behind corporate risk management solutions, Velsoft has everything you need! With COSO ERM course material, the ISO 31000 management standard, and everything an instructor requires to teach the importance and basics of a business risk management plan, Velsoft's Risk Management training material is perfect for the trainer who wants to conserve their energy for the classroom rather than spend it on their prep-time. All courseware material is completely customizable, allowing trainers to individualize their content to meet the needs of the classroom and make their risk management training even more effective. At the end of this course, students will be able to implement their risk management solution in their own corporate workplace. Instructors can even combine their risk management education with Velsoft's eLearning website and create a blended learning (www.velsoft.com) environment that makes their risk assessment training course available in the office, or on the go.